When you think of waste, you might first think of what you throw into the trash. However, that's only part of it. But waste encompasses a lot of things. Wasted time. Wasted energy. And, yes, wasted supplies. The one thing that all of these have in common is that, in the end, they all lead to wasted money. Cleaning staff around the country are facing tightening budgets. Companies, schools, and other organizations are looking at where they can cut costs. The danger of waste is that you might not even be aware it’s happening. 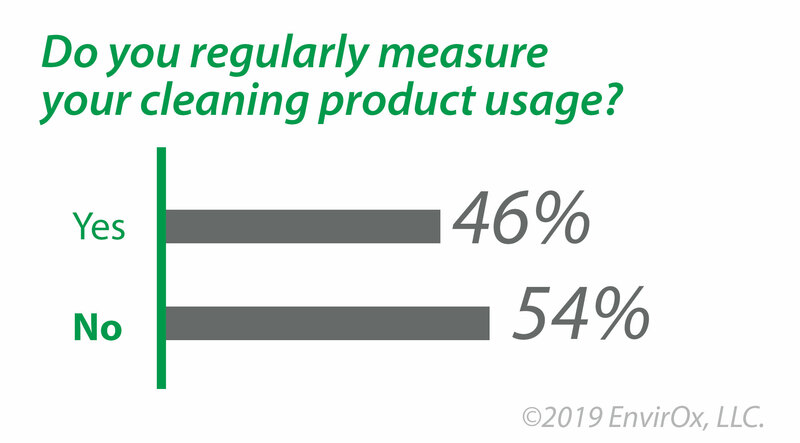 During a recent webinar, we asked the attendees there whether they regularly measured their cleaning product usage. 54% of the respondents said that, no, they did not. This is one area that facility managers have direct control of that could help save costs. Although cleaning product costs might be a small fraction of your overall budget, you might be surprised how quickly the dollars can add up. It's vital that you have a baseline of how much cleaning product you use in a particular period (a month, a quarter, a year) so that you can monitor usage and make sure the cleaning product isn't being wasted. Contact your cleaning product manufacturer. They should be able to provide you with an estimate of how long a bottle of concentrate should last depending on our square footage and daily cleaning regimen. This is also a great way to detect a bad deal! Do some research into other companies and ask the same question. If your current cleaning product SEEMS inexpensive, but you end up going a lot more cases per month, then it might not be the deal you thought it was. Carry out a test for yourself! Make sure staff are correctly following dilution and cleaning guidelines for one week. Multiply this by four for an estimate of how much product should be typically used in a month. Keep track of how much cleaning product you order, and how long it takes until you need more. If it’s not close to your estimate, then something could be wrong. It’s not good if the cleaning product usage is way below your estimate, either. That might mean that proper cleaning procedures aren’t being followed! Seasonality. Sometimes you have to increase your usage. For instance, in the winter time, you might need to use more product to tackle ice melt residue. Make sure you factor this in. How much cleaning product is staff using per job? Are they following the specified dilution rates? Some janitors, especially if they are new, might think that more cleaning product = more cleaning power. This can be a very costly mistake that also makes surfaces look dirtier because too much residue is being left behind. Make sure dilution rates are being followed. If you don’t have dispensers in place that dilute the product correctly with a touch of a button, look into that. You might also look at a closed-loop system if you don’t already have one. This helps prevent over-usage of product. Take a look at how effective the cleaning product is. Do custodians have to go over a floor twice to get it clean? Then the product you’re using might be poorly suited to the task at hand. Are proper cleaning procedures being followed? If you're using a concentrated product with a light and heavy dilution, be sure that staff is using the right variant for the job. You want to make sure that high-touch surfaces are correctly sanitized after they've been cleaned. Light dilution can be used on floors and larger surfaces. Follow the recommended cleaning instructions.